And that’s it … It’s done! My little girl just got one year. I can not believe how fast happened. The first months seem long and then the time flies … All I know is that I am lucky to have her and that I love her with all my heart. 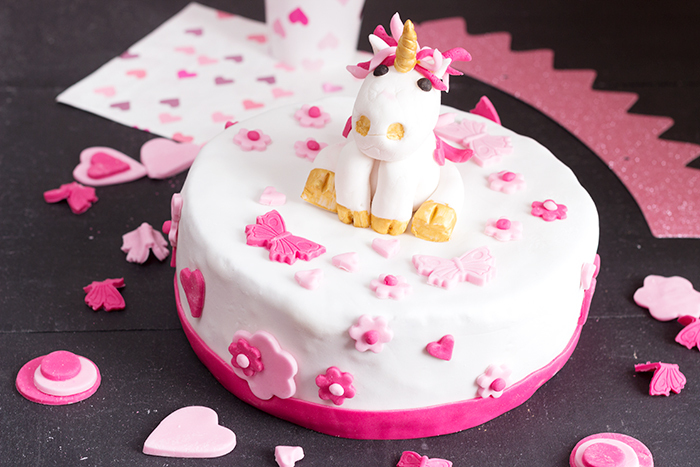 So to show Julie a tiny little part of all this love, I thought what could be nicer than a unicorn birthday cake. Come on, let’s do cake design! It is not so difficult if you are well organized, so we gather the material and we start! For the unicorn, I followed this tutorial really well explained even if mine has a few extra pounds! hehehe! 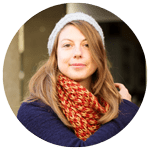 Sorry the tutorial is in French guys but google translate is a wonderful tool! Prepare the sugar cake decorations well in advance because it takes time and it keeps very well in an airtight box. Sprinkle your work surface with icing sugar. Let them air dry for 24 hours then put in an airtight container. Preheat your oven to 180 ° C. Mix the flour, sugar, salt and yeast in a bowl. Whip the egg yolks, the fruit juice, the grape seed oil. Add the mixture with the flour and mix quickly until you obtain a homogeneous paste. Beat the egg whites and incorporate them into this mixture. Butter your mold 20 cm. Pour the dough and bake for 50 minutes to 1 hour. Let the cake cool for 10 minutes. Unmold and let cool on a cake rack. Pack in food film and place in the refrigerator. Prepare the butter cream by mixing the soft butter, the icing sugar and the vanilla extract with the robot. Spread butter cream on the sides and top. Repack in food film and then refrigerate for at least 1 hour before covering with sugar paste. Take the cake out of the fridge. On 2 sheets of parchment paper, sprinkle with icing sugar and spread a piece of sugar paste large enough to cover the cake. Place the cake in the center. Put your hand under the parchment paper and turn everything over so that the sugar paste is on the top of the cake. Take off carefully the parchment paper. Stretch the sugar dough a little to cover the edges of the cake and smooth with the straightener then cut the excess dough with the pizza wheel. 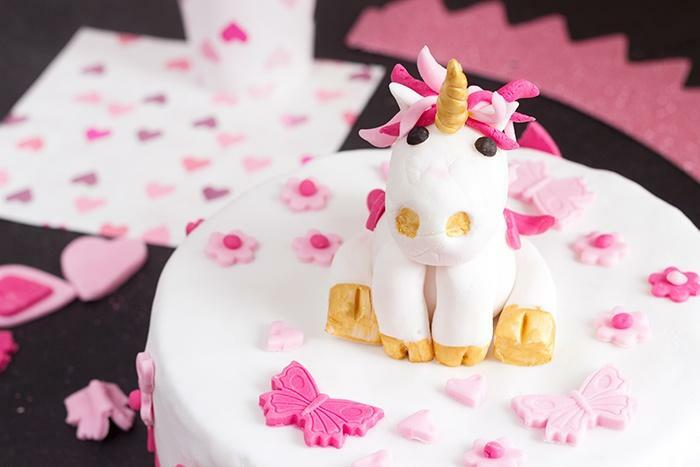 Place your unicorn in the center of the cake after applying food glue, then place your decorations trying to hide the unsightly elements that may have appeared during the work of laying the sugar paste. 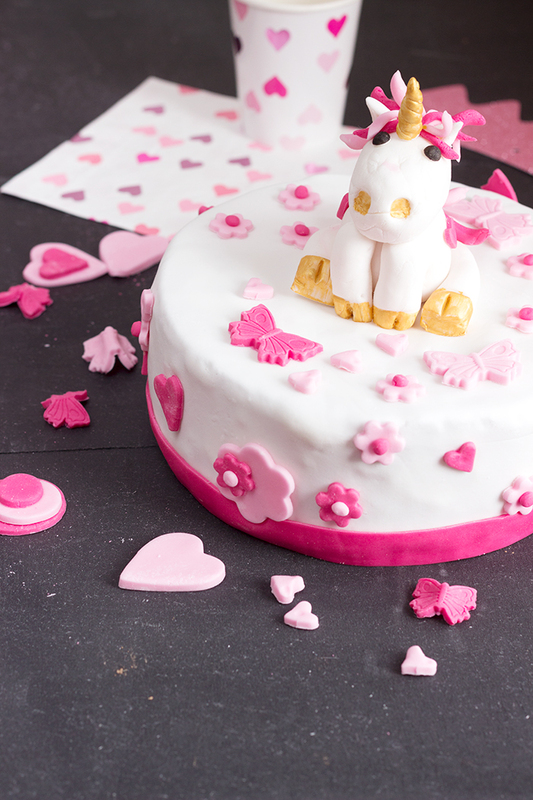 It is also possible to add a ribbon made of pink sugar paste at the base of the cake as in the photos. That looks a very interesting cake Natacha; I might make it, without the decoration, next time we have guests for tea. Happy birthday Julie. It doesn’t seem a year since you told us about her to me either. Yes the time pass by so fast :). Thank you very much for your kind words. This cake is nice actually with some tea :). 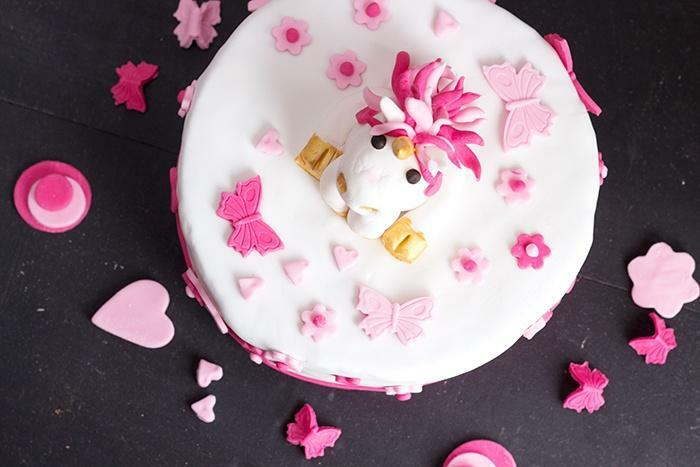 What an adorable cake, well done! That’s a really lovely cake and the instructions for the ‘Licorne’ don’t seem too difficult which is excellent.